EDITOR’S NOTE: Tomorrow, March 20th is the first day of Spring – a time of renewal and re-awakening. March 20th is also “Kick Butts Day” – and nationwide effort to reduce youth smoking and set a day to quit. Here’s more about the impacts that smoking has on our community’s health. But what about “Third-hand smoke” — what’s that? Third-hand smoke is the ash and dust that holds up to the same 4,000 chemicals, including nicotine, that gets absorbed into the surface of other materials such as walls, clothes, and floors. Then are slowly released back into the air of your home. According to Prof. Manuella Martins- Green UC Riverside CA, “Children and the elderly are especially vulnerable to Third-Hand Smoke (THS) and its impact on health. Because infants frequently crawl on carpets and touch objects exposed to exhaled smoke, they are at high risk for THS exposure. The elderly are at high risk simply because older organs are more susceptible to disease.” While the toxic byproducts of the act of smoking is dangerous, the chemical nicotine causes the veins to swell and blood flow is slowed. This is especially serious when people who have diabetes that are vulnerable to peripheral vascular disease or narrowing of blood vessels that carry blood to the leg and arm muscles. There is danger of a blood clot blocking a narrowed artery, and the result could be damage to or the loss of an arm or leg. Exposure to nicotine, in any form, is a major risk factor of peripheral vascular disease and more severely for smokers than nonsmokers. 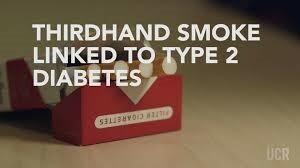 Diabetics who smoke or are exposed to second/third hand smoke are twice as likely to develop this disease and increase dramatically their chances of amputation. 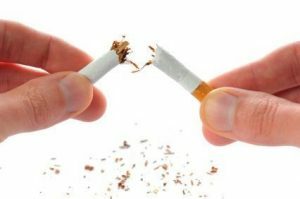 The good news is that when smokers quit, the swelling is reduced immediately and blood flow returns to parts of the body like hands and feet. And in cases where surgery is needed, it’s more likely to be successful in people who’ve stopped smoking! Thinking about quitting? Setting a date is a great first step – and March 20th is Kick Butts Day – a national day to encourage smoking cessation, and in particular end youth smoking. There is help and effective programs, call Oregon Quit Line at 800-QUIT-NOW (800-784-8669), or www.quitnow.net/oregon.